If it's been too long since you've created something with your hands, since you've done something fun with a girlfriend, or since you've had a few hours to yourself away from your kiddos -- come take a workshop. Trust me, it'll be fun. 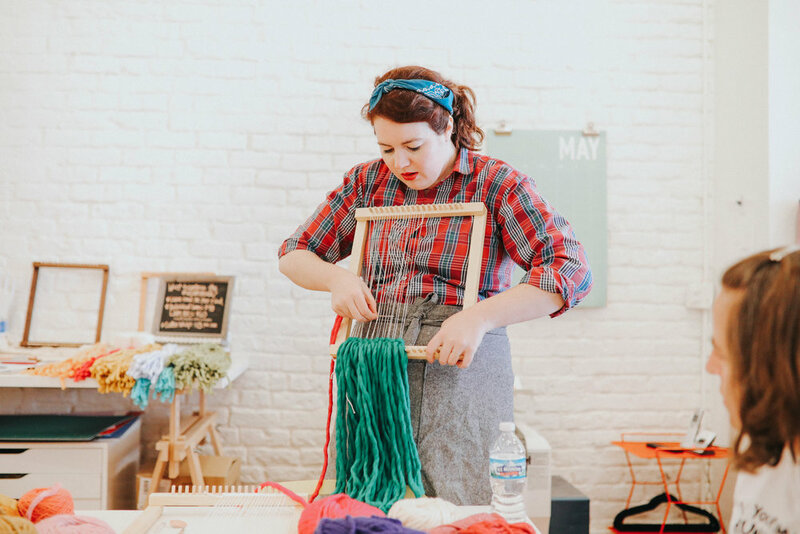 I teach beginner-level workshops throughout the Midwest to crafty and non-crafty people alike. I joke that my students are either perennial crafters who have tried every medium or those who haven't made anything since their finger-painting days. Either way, I promise I'll help you make something beautiful. I frequently teach workshops in these cities: Columbus, OH; Cleveland, OH; Cincinnati, OH; Toledo, OH; Pittsburgh, PA; Bloomington, IN. Have a venue suggestion or want me to come to your city? Email me and let me know! Check out what past students have to say about my workshops! 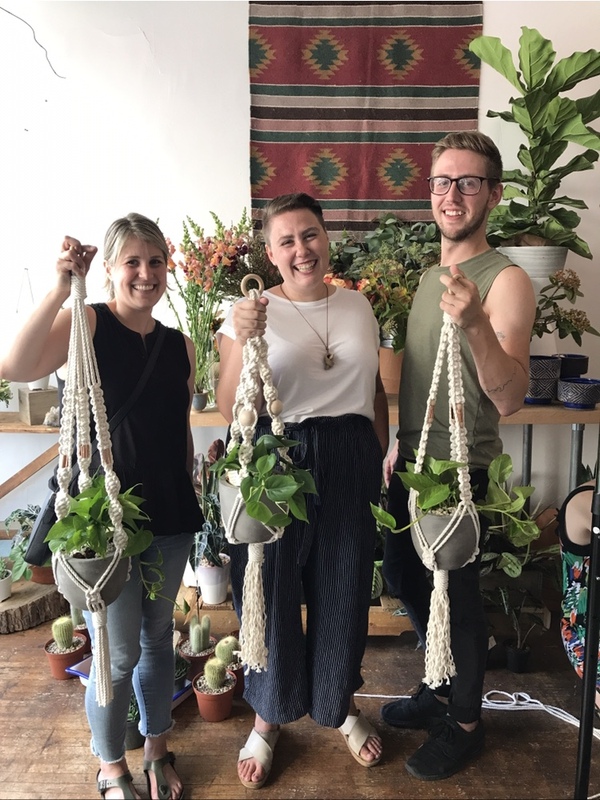 "I took a macrame plant hanger class with Sarah and then immediately signed up for the weaving class. Sarah is super patient with beginners, creative and lots of fun to be around. I walked away with the skill and confidence to create my own pieces from both classes." "If you are looking for an experience where you can meet new folks, laugh and learn to make something you'll be proud of, look no further than classes with Sarah!" "I'm so happy I took the macrame wall hanging workshop with Sarah. I was planning on teaching myself, but it was so nice to have hands on instruction and all the supplies I needed to get started. Sarah was really patient and offered a lot of tips and tricks. It was fun to see what the other classmates created also." "I absolutely loved Sarah's macrame workshop! I never thought I'd ever be able to make a hanging on my own, but it was all totally approachable under her awesome guidance. I'm so excited to have a beautiful piece of new artwork hanging in my home." Is everything included in the workshop fee, or do I need to bring additional supplies? All the materials you need to complete your project are included when you purchase your workshop ticket. The only things I would suggest you bring are water, some snacks (especially if you are taking a 3+ hour weaving class! ), and a positive crafting attitude! One thing to note: to keep the cost of my weaving classes low and more accessible to those who just want to try weaving, your loom and weaving tools (scissors, needle, warp) are not included in the workshop fee. However, all looms and tools are for sale at the end of class (and discounted for students!) if you catch the #weaverfever and decide to keep weaving! Will I finish my piece in class? Yes! I hate the idea of someone going home with a half-finished piece and losing the will to finish it. All my classes are designed to lead you in creating a piece from start to finish. However, as you're making plans for the day of the class, I would encourage you not to schedule anything right after the class ends; students frequently stay up to a half an hour after class finishing their piece (especially in weaving classes). Absolutely! I find that at least a third of sign-ups are people who registered and decided to attend alone. Don't be nervous -- you'll make lots of crafty new friends in no time! If you're convinced you need a buddy, here are frequent pairings I see at my classes: friends, mother/daughter pairs, co-workers, and couples. Do I need to be a crafty person? No way! Have I mentioned that I had never touched a skein of yarn until I started weaving? Both weaving and macrame are very beginner-friendly crafts that require just a little help up front. Even if you can't glue two popsicle sticks together, I guarantee I can get you weaving/knotting. Yes! I love teaching at private events such as: corporate workshops, bachelorette parties, baby showers, birthday parties (adults or kiddos! ), girls' night out, or family events. I price per person and you'll need at least 6 people to attend. If the workshop is outside of Columbus, OH, there will also be a travel fee. To learn more, fill out the form below and we'll get the conversation started! Will I be addicted to weaving/macrame after the class? Have more questions or want to start the conversation about a private event? Fill out the form below!